In spinal stenosis in the lumbar column a displacement of the vertebrae is more and more common, that is, the vertebrae are no longer exactly on top of each other, but rather slightly stepwise on top of each other. This discovery, called olisthesis or spondylolisthesis needs particular attention. For one thing an unstable situation can occur here, which is pain-triggering (even ‘real’ listhesis), in this case a stabilisation must be made. 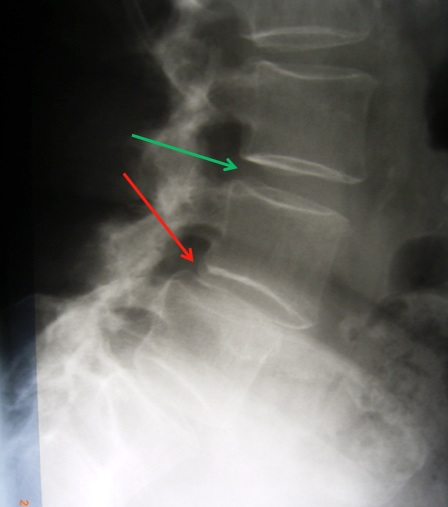 It is more common however in patients with spinal stenosis to find a so-called degenerative or pseudolisthesis. Here there is a vertebral misalignment WITHOUT pronounced instability, so one can operate gently with a new dynamic stabilisation without compression. I have been using this new method since the beginning of 2012 and have been very satisfied with the results. I implant after the successful osseous decompression (as above) to prevent drifting, a dynamic stabilization in the form of two titanium springs with definite bias of the company Sympirica Spine Inc. (USA). 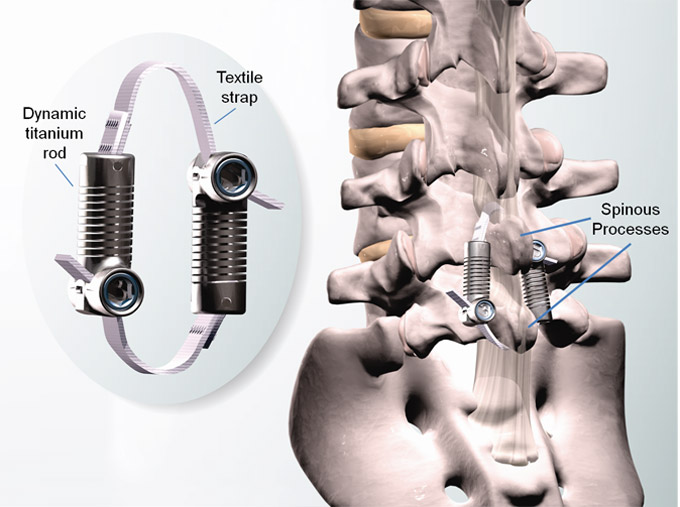 The dynamic stabilisation is implanted in the spinous process without screws and causes an effective movement boundary. 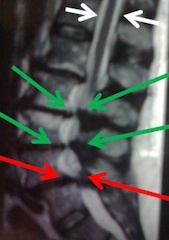 Osseous spinal stenosis without removal of vertebra (green arrow) in the L2/3 and L3/4 segments. Osseous spinal stenosis with removal of vertebra (red arrow) in L4/5 segment.